Background: Ammonium bifluoride is a reagent widely used in organic synthesis; however, the systematic collection and classification have not been covered until now. Methodology: In this review, we aim to systematically summarize the application of ammonium bifluoride in organic synthesis. Conclusion: It can be used for deprotection of hydroxyl protected groups (esp. Silyl protection). It is also used for introducing F & N atoms into organic molecules; promoting cyclization reactions acting as a multifunctional reagent. 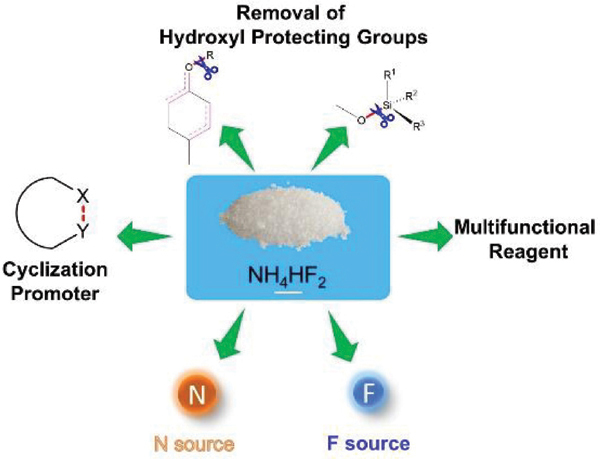 Ammonium bifluoride, removal of hydroxyl protecting groups, fluoride source, nitrogen source, cyclization, multifunction reagent, organic synthesis.